Editor’s Note: I’m beginning to put together the documentation package for Shion. The document below is intended to serve as a quick introduction to users new to Shion. I’d appreciate any feedback that you may have. In particular, I’m interested in knowing where I’ve gone in-depth too much or not enough. Ideally, Shion will be sufficiently intuitive and self-documenting that a full manual becomes redundant. Whether that is achievable is something that I’m exploring. Thanks! 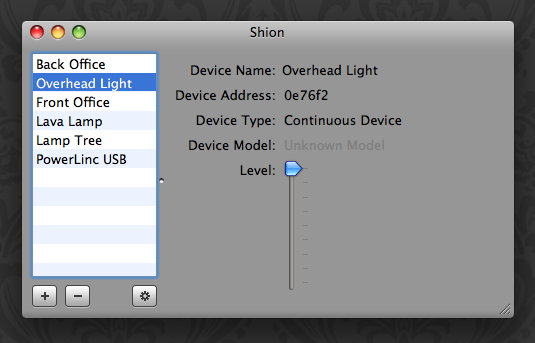 Shion is a program for the Mac that lets you control electrical devices in your local environment. Shion communicates with these devices using electrical modules that translate Shion’s orders into actions (turn on the toaster, dim the lamp, etc.). Devices may be activated manually, as a collection (using snapshots), or automatically (using events). Shion’s features are available from the menu item as shown in the screenshot above. If you don’t have Shion, you can get it from the Audacious Software website. Shion is compatible with both X10 & Insteon modules. Appliance modules are toggle devices where the devices are either on or off. Lamp modules are continuous devices where the devices can be somewhere between fully on and fully off (e.g. 25% brightness). Toggle devices use simple on/off switches where continuous devices use sliders that let you pick the desired level between completely on and off. Select Devices... from the Shion menu item to begin controlling your devices. In the future, Shion will support additional types of devices, including thermostats, motion detectors, chimes, and more. 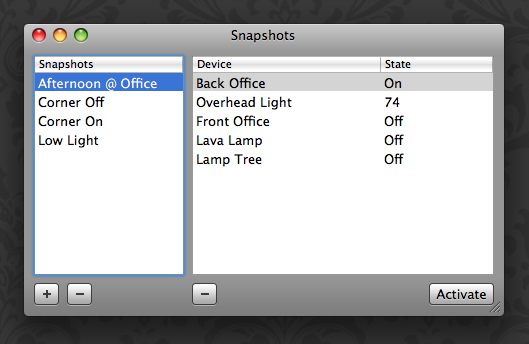 Instead of writing programs to set up multiple devices simultaneously, you can use snapshots. To create a snapshot, setup your environment how you like it, and then take a new snapshot. Shion will remember how your devices were set up and set them to the saved state each time you activate the snapshot. If you wish to exclude specific devices from a snapshot, you can remove it from the Snapshots window. 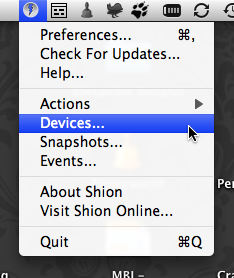 Snapshot functionality is available from the Snapshots... item in the Shion menu item. Events are occurrences that happen outside of Shion that may be useful to the program. (Sunrise and sunset are two examples of events.) Events are associated with actions: When an event occurs, an action is taken. 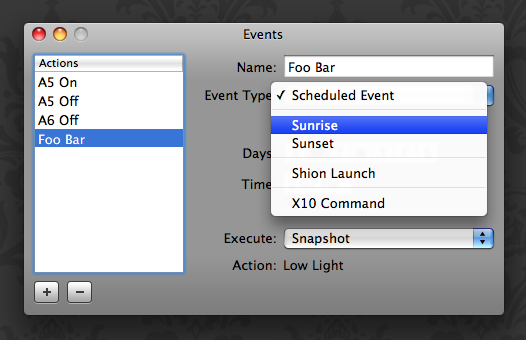 Shion allows you to associate either snapshots or AppleScripts with events. For example, by associating a snapshot to turn on a porch lamp with sunset, you have just created a smart lamp without using any sensors. When you associate a AppleScript that turns on your bedroom light when you want to wake up, you have just turned your entire room into an alarm clock. By associating snapshots containing INSTEON devices with X10 commands, Shion and your older hardware become a universal remote control. This functionality is available from the Events... menu item. This is a work in progress. If anything above is unclear or if you have questions that this document doesn’t answer, please send us a note.